Our all-round knives include everything from ergonomically designed knives for professionals to simpler utility knives. No matter your preference, the knife you choose will maintain its consistency, high-level quality, be sharp, and have maximum edge lifetime. Companion is one of our most loved and popular knives, just because, as the name suggests, it’s so reliable. This military green model is extra discrete and blends smoothly into the environment. Carving your own bark boat and watching it sail away down the stream is a special feeling. The Scout knife is the perfect first knife for just that, with its solid finger guard and rounded tip. Remember to always watch carefully over children when they are woodcarving. A full tang knife has been at the top of the wish list for our most dedicated users for a long time. Now finally it’s here, and we’re convinced that Garberg, with its sturdy design and shock-resistant material, will be greatly enjoyed by both experienced and new members of Team Morakniv. 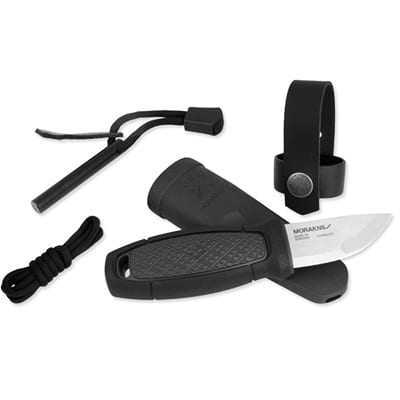 Small Morakniv Swedish knife with 12c27 stainless steel blade. Synthetic handle with non-slip textured.